Up 8 points at 10:15 p.m., the campaign for U.S. Rep. Mark Critz, D-Johnstown, announced tonight that Democratic foe Jason Altmire has called to concede the primary tonight. Mr. Critz used his deep home base support and the awakened might of organized labor to win his fratricidal bout with fellow Democrat Jason Altmire, picking up his latest latest narrow victory in an increasingly conservative congressional district. He piled bigger margins in Cambria and Somerset counties than Altmire was able to do in his Allegheny/Beaver home base. Mr. Critz now faces Mr. Altmire’s 2010 Republican foe Keith Rothfus in the 12th District race. He will have to refill a warchest weakened by his battle with Mr. Altmire, a battle that was forced by Republican mapmakers who put the incumbents in the same seat during decennial redistricting. Mr. Altmire is a former UPMC lobbyist and his 2010 vote against President Obama’s health care reform package may have been his undoing. Mr. Critz was not in Congress at the time of the health care vote. although he said that he would have opposed ti as well. But Mr. Altmire earned the enmity of labor leaders over the issue as they claimed he lied to them over whether he would support the final comprimise. In retaliation, the union hierarchy went all out to beat the former UPMC executive, with almost 20 union bodies pledging get-out-the-vote efforts on Mr. Critz’s behalf. WASHINGTON, DC – Congratulations to my colleague Congressman Mark Critz on his hard-fought and well-deserved victory in the primary. He has my full support as his campaign moves on to the fall. I want to thank my constituents who supported me by an overwhelming margin in the portion of the new 12th District that I have represented. It is gratifying to know that democratic voters in my current district continue to support me by such a large margin. Congratulations also to the democrats who reside in Mark’s portion of the new 12th District, especially those in Cambria County, who turned out to vote in astounding numbers to support their candidate. It was that turnout that won the election, and I have no doubt that the remainder of the district will have the same level of support for Congressman Critz as they get to know him. As I finish the remainder of my term, it continues to be my honor to serve the people of the 4th Congressional District of Pennsylvania. 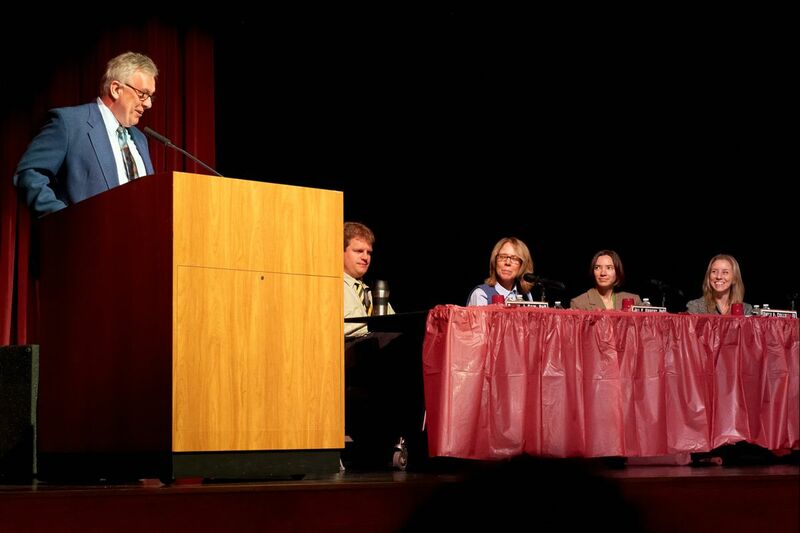 Event Chair Bob Schmetzer and panelists Dan Bain, Jill Kriesky, Emily Collins, and Erika Staaf. Photo by Bill Allen. The Service Creek Reservoir draws from a 17.7-square-mile area and serves more than 35,000 customers in Beaver and Allegheny counties through the Ambridge Water Authority. Link to Times article here. AMBRIDGE — As nearly 100 residents walked out of a three-hour water protection presentation Saturday, Marcia Lehman was one of several people collecting fistfuls of blue volunteer cards. “We’re getting a ton of these,” she said after the meeting in the Ambridge Area High School auditorium. The Beaver County Marcellus Awareness Committee is assembling a “rapid response” team to activate if any gas developer should apply for a drilling permit from the state Department of Environmental Protection for property inside the Service Creek watershed in Independence and Raccoon townships. The Service Creek Reservoir, which draws from a 17.7-square-mile area, serves more than 35,000 customers in Beaver and Allegheny counties through the Ambridge Water Authority. No drillers have applied for DEP permits in the watershed, but firms hold leases for property inside the watershed’s perimeter. The rapid response team’s exact response to a permit application has not yet been determined, but it will ask the DEP to hold a public hearing before any permit in the watershed is granted. 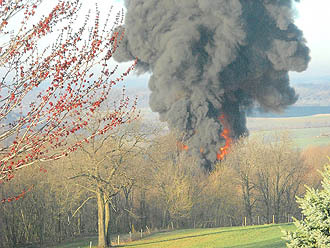 Property owners living near the site of a gas well operation that caught fire in Washington County PA Wednesday morning said they had been trying for days to reach state officials about noxious odors at the site. George Zimmerman, who owns the property where an Atlas Energy wastewater impoundment pond caught fire on Wednesday, and neighbor Kyle Lengauer, said they experienced a "horrendous gas smell" in the days leading up to the fire, but they couldn't reach state officials to warn them. "We actually left our house on Sunday because the fumes were so bad and we were so nauseated," said Mr. Lengauer, whose lives with his wife and two children on property that abuts Mr. Zimmerman's 480 acres in rural Hopewell. Both men said they heard a loud explosion at about 8 a.m. Wednesday and saw an impoundment pond on fire with clouds of black smoke. "I saw about a 100-foot flame -- you could see it seven miles away," said Mr. Zimmerman, who is embroiled in a lawsuit he filed against Moon-based Atlas Energy last year, alleging that the company "ruined his land with toxic chemicals," such as arsenic and benzene, used in hydraulic gas well fracturing." HARRISBURG — A Commonwealth Court judge has denied a request by the gas-drilling industry and top Republican legislators to intervene in a lawsuit challenging the constitutionality of the state’s new Marcellus Shale law. Senior Judge Keith B. Quigley wrote in a decision today that the legislators do not have a “legally enforceable interest” in defending the intent behind their law. He wrote that the interests of the industry will be represented by the state as it defends the constitutionality of the law. The judge turned down requests to participate in the case by Senate President Pro Tem Joe Scarnati and House Speaker Sam Smith, as well as those by a collection of industry trade associations and companies. Officials from seven municipalities, along with a Monroeville doctor and members of the Delaware Riverkeepers Network, have filed a suit arguing the the law constrains their ability to protect residents by how they craft zoning rules. Last week, Judge Quigley granted a 120-stay to the portion of the law affecting local zoning rules. The remainder of the law went into effect on Saturday. Earlier this week, attorneys for the legislators and the industry groups argued in court that they should be able to participate in the case. Karen Langley: klangley@post-gazette.com or 717-787-2141. Alliance of Retired Americans Pres. 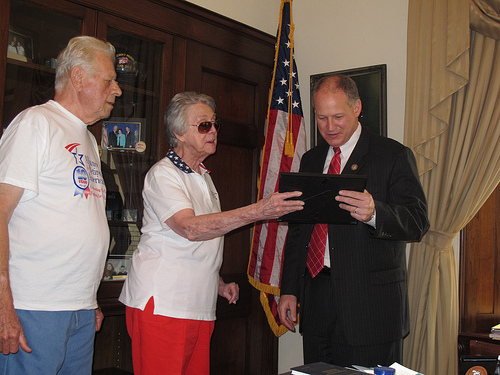 Jean Friday presents Rep. Mark Critz with 'Social Security and Medicare Hero' Award in 2011. On left is ARA member Ed Friday. The Alliance for Retired Americans has released their 2011 ratings based on 10 different votes. While the numbers were released for the entire Pennsylvania delegation, it is particularly noteworthy to look at the numbers for Congressmen Jason Altmire and Mark Critz who were gerrymandered into the same district by Republicans. The numbers matter not just as a means for comparison, but because both candidates have been trying to appeal to the senior citizen vote and each is trying to paint themselves as the stronger advocate for retired pensioners. We described that ad as a “Pants on Fire” distortion. 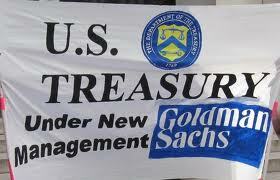 Over the past three years we have watched the banks tighten their grip on the government. Things have reached the point where the President cannot follow through on his commitments to the American people. He has promised to prosecute the criminal wrong doings of the banks. Remember the S&L Scandal and Enron. The perpetrators of these crimes were prosecuted, fined, and jailed. But the biggest crime of the century that wrecked the economy has not even been investigated. The fraud is self-evident and admitted, yet the Attorney General has not initiated action. 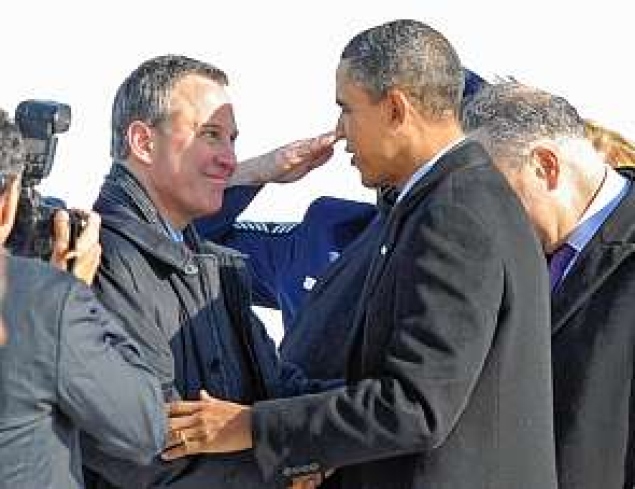 At his State of the Union Address, President Obama invited NY Attorney General Eric Schneiderman as his guest after Schneiderman agreed to the President’s package deal with the fraudulent banks. Schneiderman had held out against immunity for criminal acts and for a team in the Justice Department to investigate and prosecute criminal acts by the bankers. As we see in the New York Daily News article below, the President’s State of the Union promise to the American people to bring justice to this scandal was empty rhetoric. Nothing has happened. The labor movement’s campaign to oust Democratic Congressman Jason Altmire in the new 12th Congressional District is an important push against the bankers’ foothold in the Democratic Party. 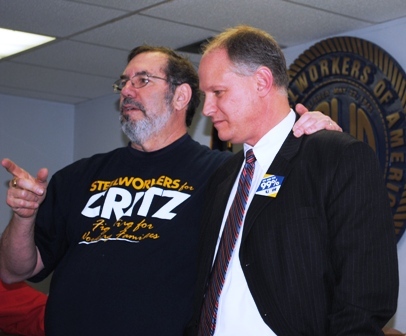 United Steelworkers Union President Leo Gerard kicked off a one week labor campaign to mobilize union voters behind their endorsed candidate, Democratic Congressman Mark Critz, who succeeded John Murtha to represent the old 12th District. Altmire is a former lobbyist for the health care industry and in his six years in Congress worked diligently to undermine the single payer movement, led the attack on the public option, and finally voted against the Affordable Care Act. More importantly Altmire runs the Keystone Fund, which washes lobbyist money that is flowing into Democratic Congressional campaigns. 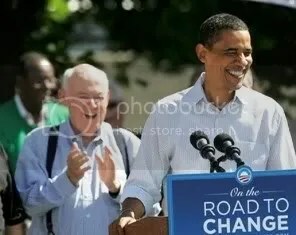 This money flow to Democrats through Altmire’s Keystone Fund buys votes to prevent national healthcare, to hold back jobs programs to rebuild our crumbling infrastructure, and to approve any and all military spending and bank bailouts. Meanwhile the 1% is paying the lowest tax in modern history while scheming to liquidate Social Security. Altmire’s Blue Dog strategy helps depress the vote by demoralizing voters. Altmire and the Blue Dogs are helping the Republicans from inside the Democratic Party. A recent investigation showed that Altmire’s phone bank and fund raising campaign is being run by a Republican consultant firm in Washington, DC. At the rally to mobilize the union vote in the April 24 Democratic primary, President Gerard aimed his remarks at Altmire. “He was a lobbyist.” Someone in the crowd shouted: “He still is” to nods all around.